Heart On The Line: Busy day!! Today has been a super busy day full of ups and downs and excitement and sadness and it's only 2:30 in the afternoon. Whew! This morning I got Clarissa off to school and then took the boys to the orthodontist. 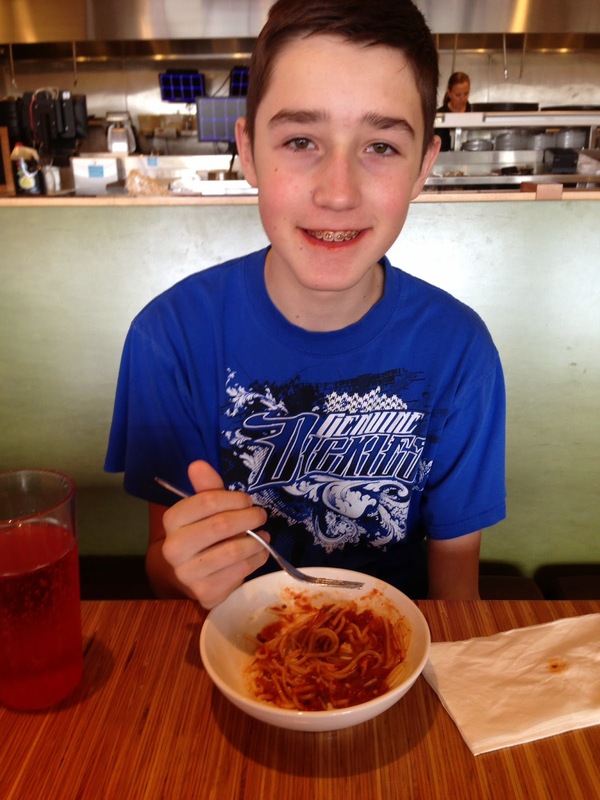 Josh got his braces tightened and today was the big day for Matthew, he got braces on his front teeth! Oh, before I tell this story I need to back up and tell another story before I forget. I was going to post about this yesterday and forgot. Tomorrow is Matthew's 11th birthday! But since he was getting braces on today and his teeth will be sore tomorrow and Shawn has to work late tomorrow because tomorrow is the day they're moving his pharmacy, we celebrated his birthday yesterday. We did presents, ate cake and ice cream, Shawn took him and Josh to a movie and we had a family Wii tournament last night, which is Matthew's favorite thing. We totally did the whole birthday thing, just two days early. It was super fun and he was excited that we got to do it early. So now back to today's story, Matthew got braces today. He has a whole complicated tooth situation that they're trying to fix that will take years, but today was the beginning of phase one. He got braces on his four top and bottom front teeth. They're hoping to start moving his overbite back so they can start working on his jaw issues. 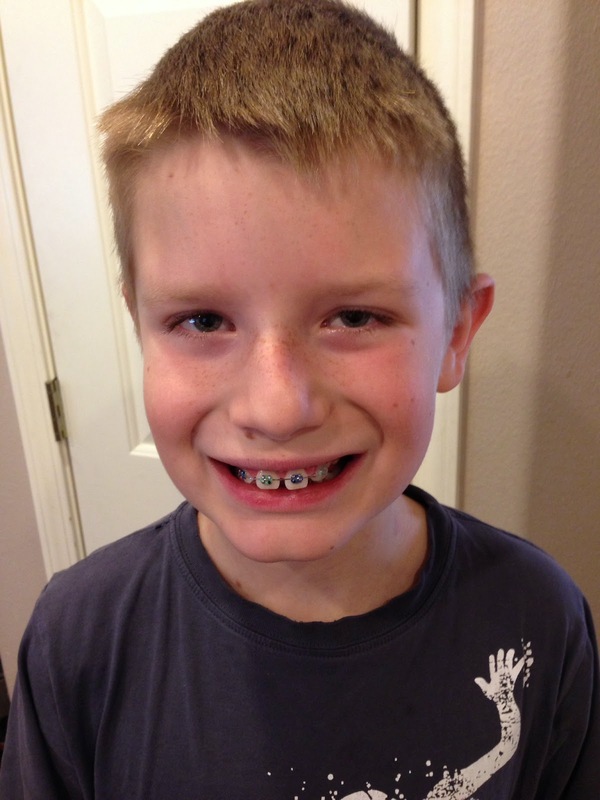 So it's only a few braces in the front, but he was super nervous about it. Josh just went through the whole braces thing a few months ago, so Josh assured him that it was no big deal. Matthew is usually my calm, cool and collected kid. Nothing phases him. I figured he'd get through it just fine. They got the braces on, he came out, they said it went great, we made appointments for next time, got out to the car and Matthew lost it a little bit. I felt so bad for him. I think it was all just really overwhelming for him. They went over all the ways he has to care for his braces, how to brush them, how to floss them, all the things he can't eat, etc, and I think all of the information and all of the change just shut him down for a minute. It always breaks my heart when he's sad because it just so rarely happens. He's so easy going that it almost surprises me when he gets upset. I always just expect him to take things in stride because he usually does. But like I told him today, sometimes it's OK to take a break from keeping it all together. He had a rough moment, we hugged it out, Josh assured him that it gets better and by the time we got home he was doing better. He's going to be fine, after a week or so the braces will feel normal and they won't bother him so much, but today it was a lot to get used to. So we recovered from that trauma and then Josh and I went over to the high school to get him registered and tour the school. So, I case I haven't already mentioned it a million times (I know, I have) Josh got in to a really amazing college prep school this year. I am so excited about this school I can hardly stand it. He's so lucky to get to go there. I wish I was going there, I love that place! He really wanted to go and we were so excited when he got in. It's going to be an incredible experience for him. If all goes well he will hopefully graduated from high school with his college associates degree. He already has a career in mind, he really wants to be an actuary, which requires a bachelors degree and a bunch of licensing exams. So when he graduates he'll only have two years of college left, which he's really going to be happy about. The actual school building is really cool and not a typical high school at all. It used to be a manufacturing plant, and it's got a bit of an industrial vibe. It's kind of cool. The school is actually also attached to an Idaho State University satellite campus, so it also has kind of a college campus feel. The school is run a bit more like a college than a high school. Because it's a school full of academic, college focused kids, they can do some things there that they can't do in typical high schools. It's also a smaller student body and it's all kind of the same sort of kids, more of the studious academic types, so it's a very supportive atmosphere, which I like. There are no sports teams, so there aren't really jocks and cheerleaders and a lot of the cliques that exist in regular high schools. The vibe I get is that everyone is in it together and there is a lot of support for each other. Because the academic program is so rigorous, they all kind of work together and support each other through it. When we were there today we stopped by a table where freshmen could sign up to have an upperclassman buddy. Josh signed up and his buddy will text him and e-mail him and see if he needs help or show him around on the first day or even tutor him if he needs help with something. I love that. What a cool atmosphere to be in. The whole time we were there today I just couldn't get over what a cool place it is. I wish every high school could run this way. I'm nervous about how tough the program is, because it's basically honors and AP everything, with almost no electives, but Josh feels prepared for it and it's something he really wants to do. I'm proud of him for all the great choices he's making and I'm so excited to see what the future holds for him. He's so incredibly focused and goal oriented. He's got a handle on life that I wish I had at his age. Or frankly, my current age, lol. So here is a photo rundown of my day. and it really was. But sometimes it's way fun to do something ridiculous with your kids. Then we came home and consoled Matthew. This isn't a great picture. I'm going to do better pictures for his birthday tomorrow. But I think he looks super awesome with his new braces! The it was off to high school. The fact that I have a child in high school really freaks me out. 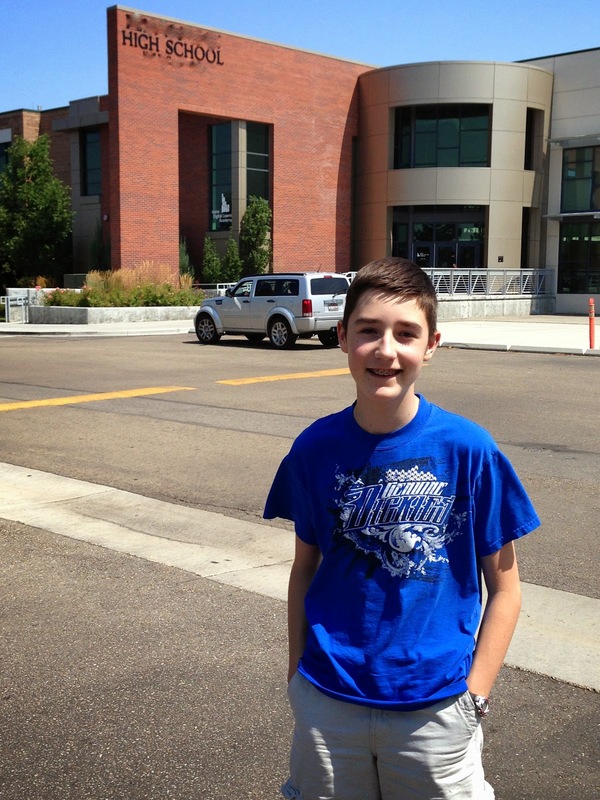 I'm not sure how time flew by so quickly, but if he has to go to high school, at least he gets to go to a cool one! Tune in tomorrow when I have another freak out after I register Matthew for middle school. All this change is exhausting!